GRANT DUNCAN of Amuri Lime explains why, after looking at three different brands, he decided to buy a second Hitachi wheeled loader from CablePrice. A couple of weeks after Amuri Lime took possession of its new Hitachi ZW310 Wheeled Loader, works manager Grant Duncan says he, “couldn’t be happier”. A lot is expected of the 22,400kg machine at the North Canterbury site, where it does everything from carting rock from the face to the plant, to putting it in the crusher and loading trucks. However, Grant says the versatile machine has no trouble delivering. “The comfort and speed of the loader is great, and I’ve noticed a big step-up in terms of technology from our older Hitachi loader. The mobility and stability of the machine are also impressive, he adds. 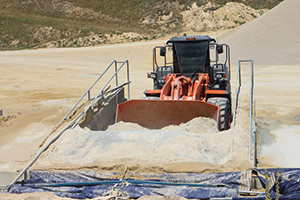 Grant is the sole operator at Amuri Lime, a cooperative run by several local farmers, which has been supplying high quality, affordable crushed agricultural lime, driveway chips and rocks direct to mainly Canterbury and West Coast clients since 1945. He says the company looked at three different brands after deciding to purchase a second wheeled loader for the site, but stuck with Hitachi and CablePrice after getting good service and value for money out of its previous machines. 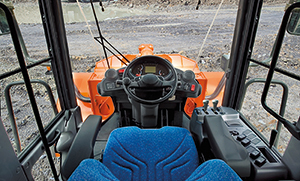 The panoramic cab in the ZW310 gives almost all-round visibility due to a widened front glass window and pillar-less cab rear corners, he says. The hydraulically-operated cooling fan is another time saving feature, as it can be reversed for easy removal of dirt from the radiator. Grant says the ergonomically positioned joystick controls with a forward and reverse button are also easy to operate. The safe, quiet, environmentally friendly design of the Hitachi ZW310 Wheeled Loader includes a leading edge, low emission diesel engine and a number of advanced mechanisms that provide enhanced durability, ensuring it can handle the toughest work conditions. Superior lifting ability, big production capability and continuous reliability are other hallmarks of the machine. Grant says Amuri Lime had a “good run” with CablePrice through the acquisition process. When the machine arrived in site, it was in top shape, he adds.